Is Saki Rice Wine Good for You? Sake — also saki — is a traditional Japanese beverage that is often referred to as rice wine. Sake is most similar to Korean rice wine or Chinese baijiu. This alcoholic beverage is traditionally enjoyed with sushi or other umami-flavored foods. Like most other alcoholic products, it should be consumed in moderation and has limited nutritional benefits. Sake is a traditional Japanese alcoholic drink made from rice that has been fermented. It's typically clear, yellow-tinted or slightly cloudy in appearance. You may find it served cold, hot, at room temperature or even sparkling. Flavors range from crisp and refreshing to floral and sweet. This beverage has been consumed since around A.D. 400. Even though sake is often called rice wine, its production historically has been similar to that of beer or a light spirit. While Belgian and Dutch Christian monks were brewing beer in Europe, Buddhist monks were creating sake in Japan. Like beer, sake is made through a fermentation process using bacteria and yeast. Typically, sake is made using one of two types of starter cultures: sokujo-moto or yamahai-moto. These cultures are mixed with rice, malted rice and water. The fermentation process differs based on the chosen starter culture. The starter culture can also influence the duration of the total fermentation process. The bacteria that proliferate throughout this beverage contribute to sake’s unique range of flavors and influence the quality and consistency of the final sake product. As with all alcoholic beverages, it's always possible to wind up with a hangover from drinking sake. Always consume alcoholic beverages in moderation. The benefits of sake are actually not very well studied. The differences in sake can be substantial, with the sweetness factor ranked from -15 (very sweet) to +15 (very dry). As such, sugar content in sake — or the lack of — can vary dramatically and influence both the nutrients and calories in this beverage. In general, however, sake isn’t considered particularly nutritious. The drink contains tiny amounts of protein, as well as certain minerals, like calcium, iron, magnesium, phosphorus, potassium and selenium. Sake’s calories are 134 per 100 grams — meaning that this beverage is actually mostly empty calories. 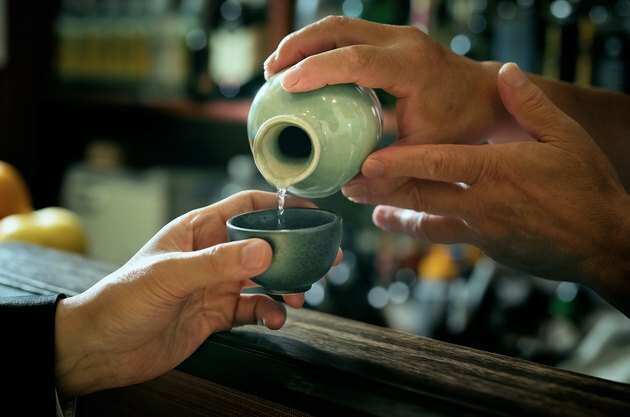 Despite the lack of nutritional benefits, certain components of sake have been shown to have positive health effects. These beneficial effects are typically due to either the ingredients used to make sake or the fermentation process itself. In particular, sake yeast can help you sleep, but the method of action is different from that of sleeping pills. Diets supplemented with sake yeast effectively improve high-quality, deep sleep in a much more natural way. Also, a 2018 study in Free Radical Biology and Medicine showed that sake has peptides that can help reduce inflammation. Like other fermented foods and beverages, sake can help improve conditions like inflammatory bowel disease. As such, sake has interesting and unique benefits, but shouldn't be considered particularly beneficial nutritionally. How Many Calories Are in Sake Alcohol?